Here is a new version of GPU Caps Viewer in order to reflect the changes in OpenCL due to the release of the new version of ATI Stream SDK. Your application is now responsible for selecting which of the OpenCL platforms present on a system it wishes to use, instead of just requesting the system default. Since conformance logs have not been submitted for this feature, cl_khr_gl_sharing will not be present in the CL_PLATFORM_EXTENSIONS or CL_DEVICE_EXTENSIONS string. To access this feature,follow the specification as described in section 9.11 of the OpenCL™ 1.0 Specification (revision 48). Due to some instability with GL interop, I disabled this interoperability support by default. To enable and test GL interop, just start GPU Caps with the batch file Start_OpenCL_With_GLInterop.bat. GPU Caps 1.8.x has some known issues: in some situations, the initial hardware scanning encounters an infinite wait state maybe due to OpenCL initialization. Since I'm not able to reproduce the problem, I added a command line parameter to disable OpenCL support. You can start GPU Caps with this parameter by launching the batch file called Start_Disable_OpenCL_Support.bat. Please give me your feedback about this option. Change: added the use of the GL interop preview available in ATI Stream SDK v2.0.0 for Julia 4D and 1M Particle demos. But due to some instability, the GL interop is not enabled by default. To enable GL interop, start GPU Caps with the batch file Start_OpenCL_With_GLInterop.bat. New: added a command line parameter to disable OpenCL support (/disable_cl_support). Bugfix: added the specification of context properties in clCreateContextFromType (instead of NULL) for ATI Stream SDK v2.0.0. From what I know, you can’t use the AMD OpenCL implementation with a NVIDIA board even if you only want to test the OpenCL CPU support. All the samples run fine with the –device cpu extension on my laptop with Intel Core 2 Duo T5600 @ 1.83GHz and a NVIDIA GeForce Go 7300. About the NVidia and AMD, i’ve allready mentioned that it’s working with AMD CPU + NVidia GPU. But i’ve tested that with Beta version of Stream SDK. @ca$per > you’ve done the AMD CPU + NVidia GPU test with GPU Caps ? Hi to all, im using an intel cpu and Nvidia GPU, i have tried different things but still the GPU caps viewer doesnt show the opencl for CPU!!! I have already installed the ati stream sdk 2.0 completely!! any workaround for that? 2 JeGX: oops. Sorry. I must’ve missunderstood what you were talking about. I made them to work just on my own. Hi JeGX, where did you get that version of 1.8.2??? and can you tell me have you installed any other thatn ati stream sdk 2.0 package?? @Balaji: the version 1.8.2 is the forthcoming version but currently is not available because I’m working on. As soon as I resolve my problems, I release it. Hi thanks 4 the info mate, can u tell it a bit elaborate? Nvidia opencll.dll is in the system32 folder am i right? It should contain a list of the OpenCL ICD’s. This is what the offical OpenCL.dll searches. Does it have both ATI & NVIDIA DLLs listed in there? Also you can use Dependency Walker http://dependencywalker.com/ to get a list of DLLs that are loaded both statically and via LoadModule(). This should show you which version of OpenCL you are loading, and what ICD’s OpenCL.dll loads. Sorry but I don’t have a PC with a DX10 NVIDIA GPU to test CUDA + Stream SDK. Another interesting observation… the ATI Stream SDK installer doesn’t always properly install. If you are missing the C:\Program Files (x86)\ATI Stream\bin folder run the MSIs in C:\C:\ATI\SUPPORT\streamsdk_2-0-0_XXXX\Packages\Apps\ folder. “My OpenCL extensions are 10 -vs- his 8. Odd…” from post #2 is still unexplained. Is this driver controlled, and why did it change? What exactly are OpenCL Extensions? My 280’s fan controller issue from post #4. That bothers me. I think that is most likely driver issue? OpenGL 3.x – Illuminated Torus. OpenGL 2.1 – Furry Cube. OpenGL 2.1 – HDR, DoF and RadialBlur. OpenGL 2.1 – HW Geometry Instancing. And why I can’t run these tests due to ‘OpenCL context: found 0 OpenCL GPU device. Bye…’.? OpenGL 3.x + OpenCL GPU – 4D Quaternion Julia Set. OpenGL 3.x + OpenCL CPU – 4D Quaternion Julia Set. OpenGL 3.x + OpenCL GPU – 1M Particles. OpenGL 3.x + OpenCL CPU – 1M Particles. OpenGL 3.x + OpenCL CPU – Mesh Deformer. OpenGL 3.x + OpenCL CPU – Post FX. Any test with CPU in it was the kiss of death! Start_Disable_OpenCL_Support.bat —-> doesnt work for me, i havent used another version of this program, can u give the link for the version 1.7.0? @jm: here is the link to GPU Caps 1.7.0. @Talonman: OpenCL extensions are the same thing than OpenGL extensions. There is an OpenCL core with a set of functions and extensions allow to extend this set of functions. An example is the interoperability between OpenCL and OpenGL also called GL Interop. The GL Interop is not include in the core functions but can be used thanks to the cl_khr_gl_sharing extension. 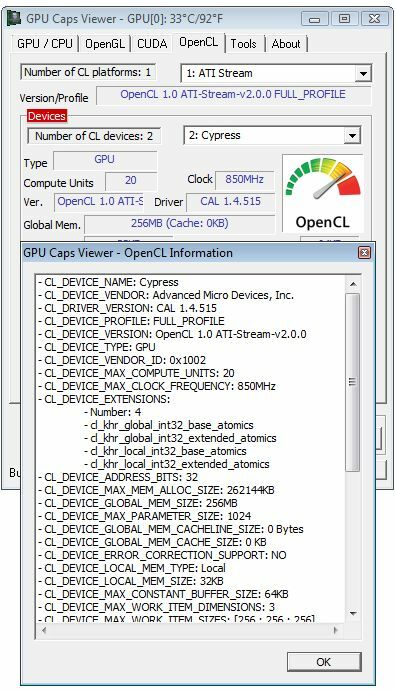 To see the complete list of CL extensions, just click on [More OpenCL information…] in the OpenCL tab. By the way, could you post a screen of your 10 CL extensions ? Indeed, I think your fan problem comes from a driver issue. Do you have the same kind of pb with FurMark ? Quaternion Julia 4D and 1M Particle are the only demos that use GL Interop if cl_khr_gl_sharing is exposed. So perhaps, there’s a driver issue with cl_khr_gl_sharing on win 7. With GPU Caps 1.8.1, GL Interop is disabled by default so you should be able to see both demos. And if you want to enable GL Interop, just start GPU Caps 1.8.1 with the batch Start_OpenCL_With_GLInterop.bat. my current HW is 2x 9800GTX on 186.18. I am not willing to change drivers as this and 180.48 are the only drivers that work on my system. @Vlad: try GPU Caps 1.7.0 and let me know. @JeGX: The version 1.7.0 works for me, thx! The CPU tests don’t, but you have given the reason why. I hope OpenCL CPU support is in the future for Nvidia. I meant to say the perfect app would be made. @Talonman: I’ll add multi-GPU support for OpenCL demos in a future version. I want to stabilize this single GPU version before. This is my current workload utilization, spanning my 295 and 280 on this latest version. %’s are listed in this order: First 1/2 of my 295, Second 1/2 of my 295, and 280 dedicated PhysX processor. 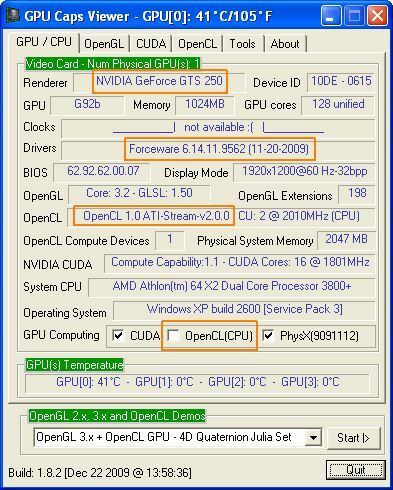 OpenGL 3.x + OpenCL GPU – 4D Quaternion Julia Set 0%, 0%, and 93%. OpenGL 3.x + OpenCL GPU – 1M Particles 0%, 18%, and 5%. OpenGL 3.x + OpenCL GPU – Mesh Deformer 0%, 41%, and 37%. OpenGL 3.x + OpenCL GPU – Post FX 0%, 5%, and 81%. OpenGL 3.x – Illuminated Torus 0%, 98%, and 0%. OpenGL 3.x – Triangle of Death 0%, 42%, and 0%. OpenGL 2.1 – Furry Cube 0%, 97%, and 0%. OpenGL 2.1 – HDR, DoF and RadialBlur 0%, 98%, and 0%. OpenGL 2.1 – HW Geometry Instancing 0%, 97%, and 0%. OpenGL 2.1 – Soft Shadows 0%, 95%, and 0%. OpenGL 2.1 – GLSL Point Sprite Particles 0%, 37%, and 0%. OpenGL 2.1 – Vertex Displacement Mapping 0%, 96%, and 0%. OpenGL 2.1 – CEL-SHADING 0%, 53%, and 0%. OpenGL 1.2 – Simple Mesh 0%, 50%, and 0%. FYI – 3 Tests are now using 2 GPU’s. One last thought… Add a script running all GPU tests, give us a score, and we have us a new OpenCL benchmark app. I figured it might be for the same reason. Opps… I meant to say FluidMark. It also puts a slight load on the PhysX GPU. FurMark is just simply using SLI.